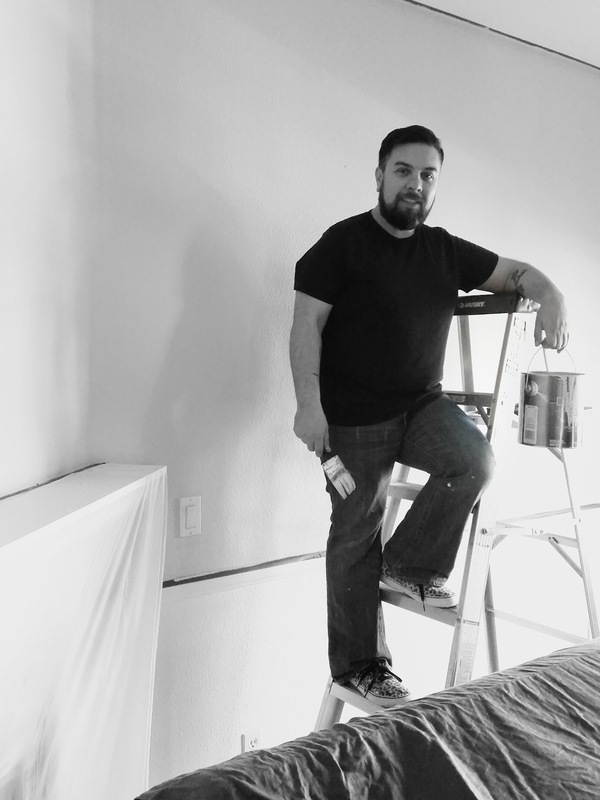 Oscar Bravo Home: A beginner's guide to painting your house. A beginner's guide to painting your house. I'm NO PAINTING EXPERT...but I have painted all the walls in my house; most of them twice. I've even painted stripes! (I'm very proud of that). 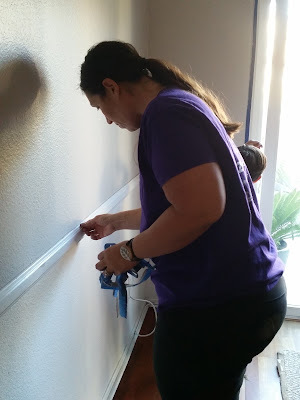 I want to share what I have learned about painting interior walls so that hopefully if you decide to paint in your home, it will be a bit easier for you. Painting your walls is the fastest way to transform a room. If you do it yourself, you can save a lot of money. Getting a professional painter can range from $400-$1200 depending on the size of your space. I spent maybe $120 to paint my living room and dining room. It doesn't take long to paint a room! I finished in a day and a half (with the help of the fam-bam). How much paint do you need?? Some items you can find at the dollar store. 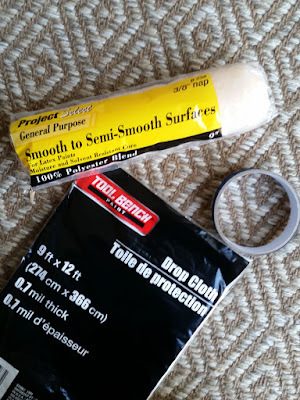 I found the plastic drop cloths, painter's tape, paint brushes and paint roller covers all at the dollar store. They also have roller frames but I recommend getting a good quality roller frame. The less expensive versions don't have a "spring-action" on the part that the cover goes over. The spring-action grips the cover and keeps it from sliding off. I purchased mine from Home Depot. The better roller frames can also be screwed on to a pole or extender. Step 1: Move and cover furniture, and tape edges. Prepping actually takes longer than painting! Take everything off the walls. Move all your furniture out of the room or at least to the middle of the room and COVER with a plastic drop cloths or old sheets. While rolling paint on to the walls, it can sometimes splatter tiny specks of paint on anything nearby. That is why I recommend covering your floors and architectural details like a mantel with a drop cloth. I also recommend that you prep the day before you want to paint. 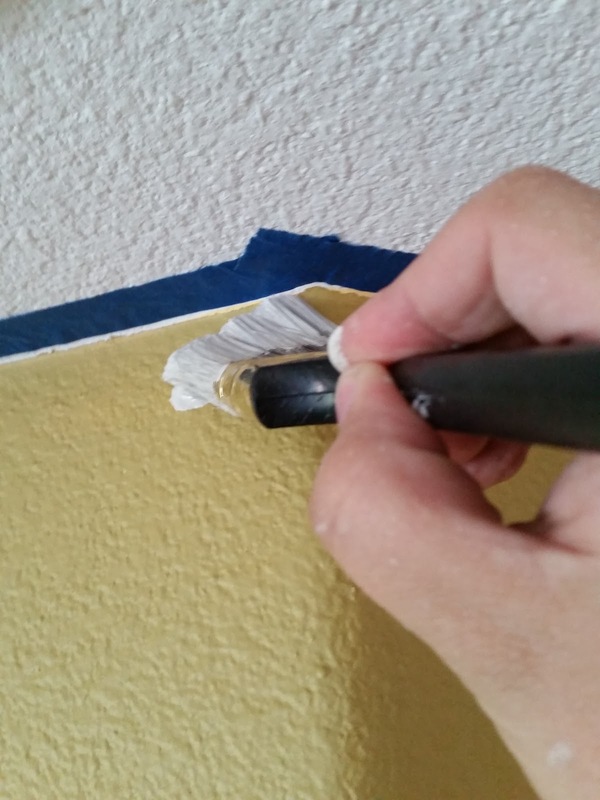 Use painter's tape to tape off the edge of your baseboards, windowsills, mouldings, outlets and switch plates. I also tape the edge where the wall meets the ceiling. If you have a very steady hand you can skip taping the ceiling which will save you a lot of time. 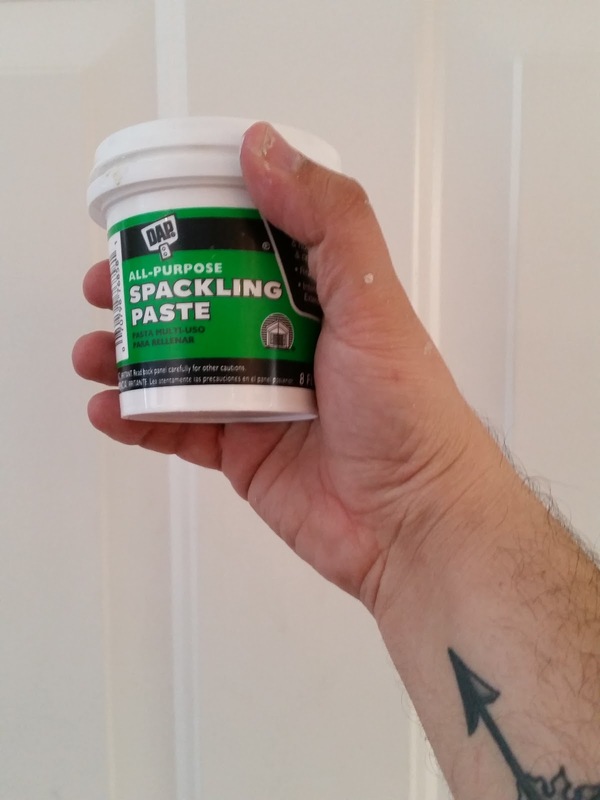 Use some spackling paste to fill in nail holes. After it dries, sand it down to smooth it out. Step 3: Paint the edges and corners of the walls. This is called "cutting" your walls. 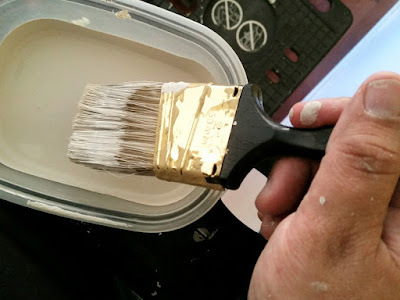 Pour a bit of paint in a small container so you're not lugging around the paint can. Your paint roller won't reach all the way to the edge of the walls or in between small spaces. Use a paintbrush to get to those spaces. *Note: In some parts I didn't tape all the way to the edge where the walls meet the ceiling because there was some bleeding from the previous paint job. I wanted to paint a nice clean line over the existing line. Once you get the corners and edges painted, you can start painting the wall! 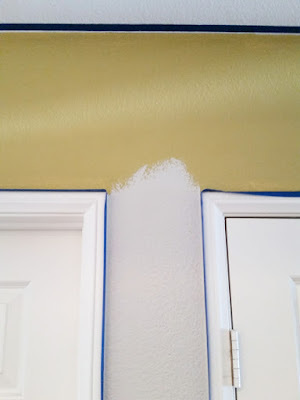 You want to paint the wall while your edges are still wet to avoid a two-toned look once dry. Step 4: Paint your walls! 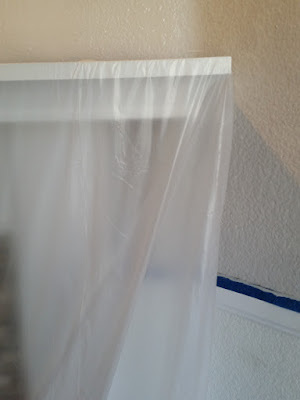 I recommend an all-in-one paint & primer to eliminate the need for priming. "Priming" your walls is when you use priming paint (usually white) to cover your existing paint on your walls. 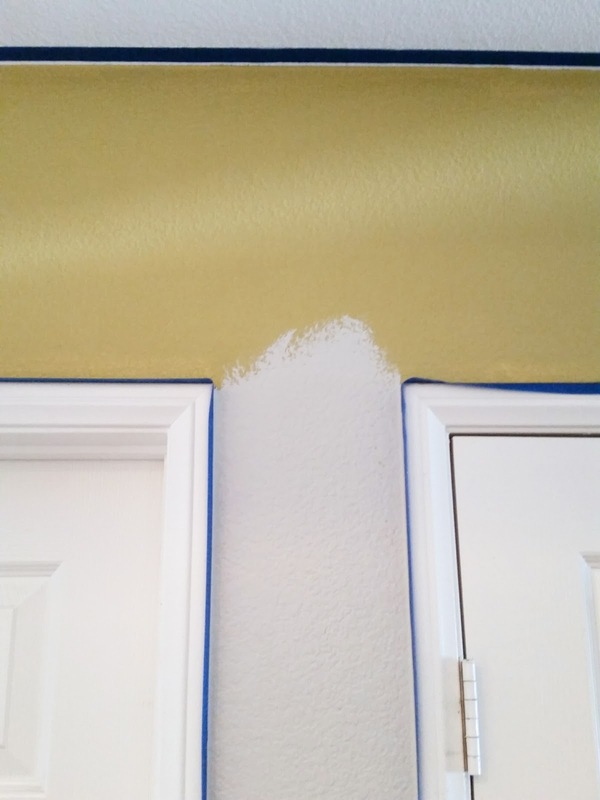 This allows the new paint color to cover more evenly and helps keep the old paint color from showing through. I also highly recommend getting a paint can lid with a spout. For a bit under $3 its a nice item to have. This was my first time using one and I LOVED IT. The spout makes it easy to pour and eliminates some of the mess. 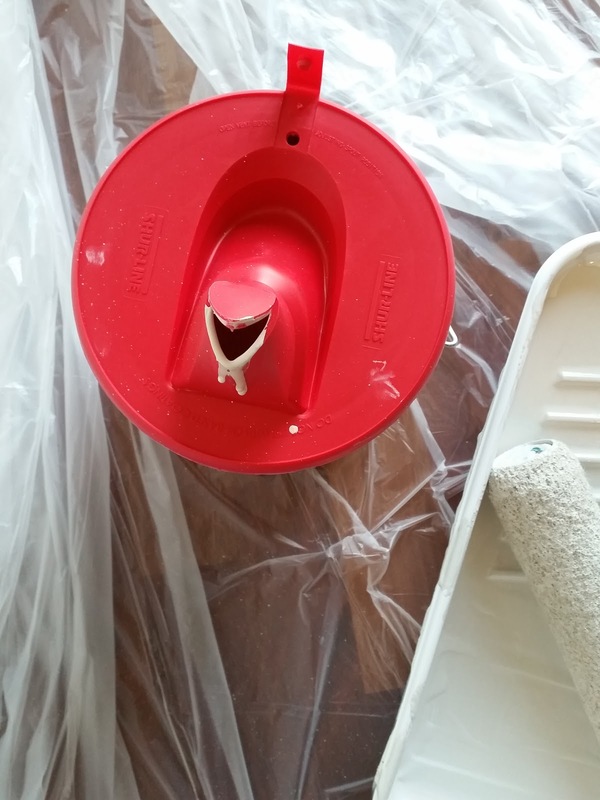 After you are done painting, simply push the spout down and store your paint away! This can lid is the Shur-Line Can lid from Home Depot. Here's a video that gives a good example of how to paint your walls, along with some good tips! 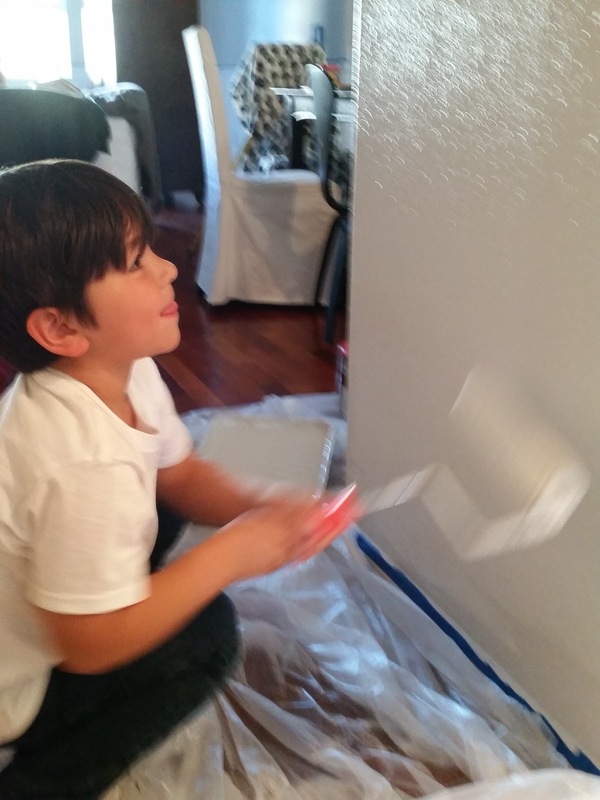 Once you finish painting all of your walls, let them dry for a few hours. Once they are dry to the touch, you can start your second coat of paint. The second coat of paint will give you much better coverage and will eliminate all the brush strokes that you were probably really nervous about! Don't skip this step thinking you'll get to it later. YOU WON'T. 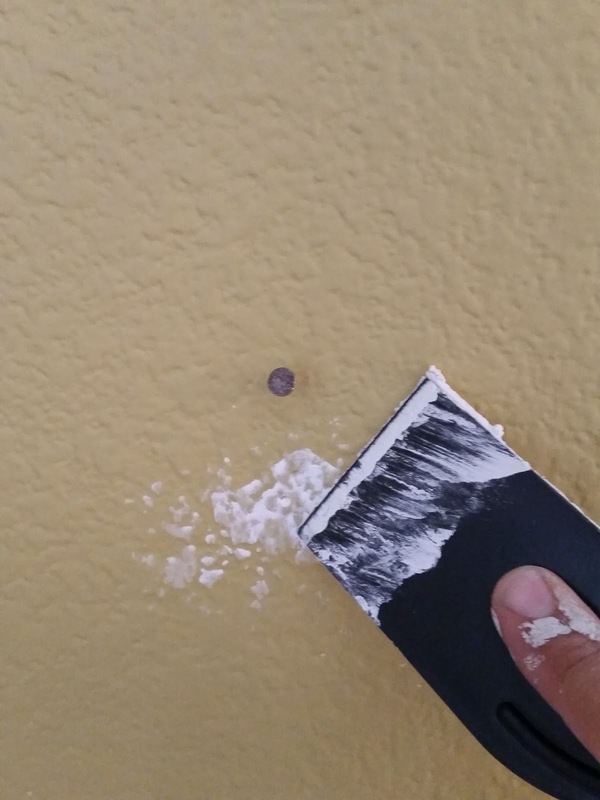 Once your paint has dried, check to see if there's any spots that look like they need to be touched up. Make sure you are checking in daylight. Any places needing touch-ups will show up better during the day. Once you are done, pull off the tape and clean up! Use plastic bags to cover wet rollers and brushes if you need to use them again later. If you leave the brush or roller out for too long without covering them, they dry out and become brittle. Have a sponge ready in case you spill a bit of paint on your hardwood floors. Use the abrasive side to gently scrub off any paint. If you do that soon enough, it should come off easily. There are different paint finishes for you to choose from. Generally, high traffic areas that need to be scrubbed (like kitchens and bathrooms) would benefit from a washable finish like a flat-enamel or semi-gloss. I prefer less shine because it hides imperfections, so I go with flat-enamel. For the living and dining areas, I like the least amount of shine possible, but still need the walls to be washable. I prefer an eggshell finish for those rooms. I recommend you speak to a paint specialist at your paint supply store for detailed advice on what would be best for your project. Paint looks A LOT lighter when wet. Don't freak out about the color not being what you wanted. Wait until it is completely dry before you freak out! When choosing paint color, take a few swatches home. Look at them in daylight and in the evening with the lamps on. Once you make a few final choices, purchase some sample paint and paint large samples either on your wall, or on a thin piece of wood board. Place them in your room and give yourself a few days to make your final decision. I hope this helps you in your first, or maybe next painting project! Here is a before and after of my painting project that I recently completed. It is amazing how much paint can transform a room! My home previously had "Desert Moss" by Behr. The new paint color is "Ghost Pines" by HGTV HOME by Sherwin Williams exclusively at Lowe's. Looks like a totally new space!! I'm in love! Thanks for reading! Don't forget to subscribe to my blog to get notifications on my posts! Don't worry, I promise not to flood your email with tons of stuff!! If you haven't subscribed yet, scroll down till you get to the post by e-mail box and enter your info! AW thanks,Z!I sincerely appreciate that my friend! Paint takes a lot and to be the best takes a lot more. The outcome to be perfect should be taken some help from learned places. 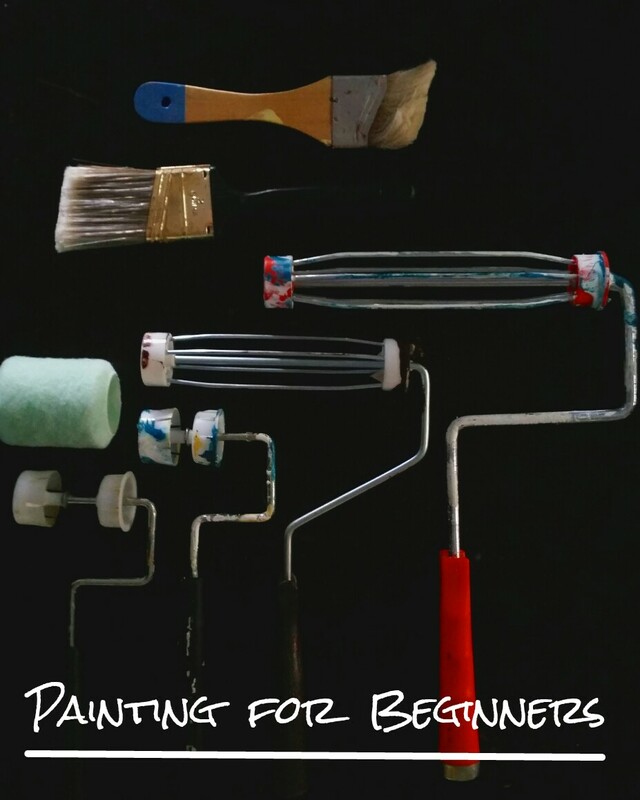 This guide for the beginners is really going to help the people who will be painting for the very first time.